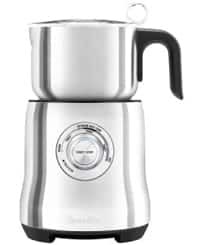 After looking at dozens of milk frothers, reviewing their capabilities and comparing them to each other, I’ve determined that the best milk frother is the Breville ﻿﻿Milk Caf﻿é. It may be on the expensive side but its extra features and build quality blow its competitors out of the water. For those looking for a cheaper alternative the Epica Automatic offers great value for money. Packed with features that none of its competitors match, the Breville allows you to customize your milk temperature and density all within a removable, stainless steel jug. Read on to find out how I choose my top milk frother, including including features to look out for and explaining the differences between the two main types, handheld and jug style. What Is A Electric Milk Frother? Everyone loves waking up to a frothy cappuccino or smooth latte. It’s one of life’s simple pleasures that gets you up and going. But In the past if you wanted to enjoy this treat you would have to buy an espresso machine just to make some foam. This was a very expensive exercise as espresso machines can cost upwards of $1000. Frankly I don't think anyone could justify spending that much money to froth milk. Luckily this is no longer the case. In the past you had to have an espresso machine to make foam...not any more. We now have electric milk frothers that create delicious foam to complete your morning brew. They're ten fold cheaper and focus on doing one task and doing it well - making great tasting foam. But what you may not know is that there's two types of milk frothers to choose from. Let's compare the two so you can decided which model better suits you. The two types of milk frothers are the “handheld” and “jug” style. Both have the ability to create foam, they just go about their job differently. Handheld frothers are simply a motorised whisker that creates foam by spinning a whisk at high speeds below the surface of milk. They are battery powered and due to their simple design very affordable. The downside of handheld frothers is that you’ll have to heat up your milk separately in either a microwave or stove before you start frothing away — cold cappuccinos are a no-no in my books. A handheld milk frother is a motorized whisk. Jug style milk frothers on the other hand combine the milk heating and frothing functions in one product. They work by using induction coils to heat the milk within the jug while simultaneously using a motorised whisk to create tasty foam. This means no fiddling with your microwave and less things to clean up. I’m a fan of devices that make a process easier. That’s why I prefer jug style milk frothers to handheld ones. Jug milk frothers kill two birds with one stone: they heat & froth the milk. The Breville Milk Café is my favorite frother because it has the ability to create the exact foam you desire while throwing in extra features that none of its competitors can match. First off the Breville is the only milk frother that allows you to set both the temperature of your milk and the amount of foam you wish to create. Simply use the circular dial to set your milk temperature anywhere from cold stir to 160 degrees (70C). To control the amount of foam you wish to create the Breville comes with two interchangeable frothing disks, one to create smooth latte micro-foam and the other to create dense cappuccino foam. The Milk Café also gives you the ability to create enough foam for up to three big cups of coffee with its huge capacity, is dishwasher safe ( you can separate the jug from the base), has a striking stainless steel design, and can make a mean hot chocolate (throw in some choc chips and see what happens). But what I really like about the Milk Cafe is its attention to detail that makes using much more pleasant. This seems to be a trend with Breville products. For example the Milk Cafe has an actual jug spout unlike cheaper models that are completely circular. This makes it easier to pour the milk out smoothly and consistently rather than splashing it all into your cup. It also comes with an innovative lid enclosure that allows you to add chocolate and sirups while the milk is frothing without messing up your kitchen. On the negative side there really isn’t anything wrong with it, my only complaint is that the frothing disk can get loose when the jug is not clean as its held on by magnetisation. However a good rinse after each froth and you won’t have this problem. It’s actually recommended that you give the jug a rinse after each use as you don’t want to reheat old milk as it’ll affect the flavour of your foam. All in all if you’re looking for a top of the line frother that gives you customisation abilities that none of its competitors can match, then the Breville is the perfect milk frother for you. When you buy the best of the best it usually comes with a price premium. This is when you look for the product that gives you the best value for money. In terms of milk steamer the Nespresso Aeroc﻿cino Plus takes out this category. For its price point the Nespresso is a great milk frother in terms of value as it has the ability to create nice dense foam while being half the price of the Breville above. Like the Breville it also uses induction heating to heat up the milk and a magnetised spinning disk to create its foam. It comes with two disks as well, one to create dense cappuccino foam and the other to make latte milk. It’s also much more straightforward to use as you only have to press one button to start frothing. In my experience the frothing process takes between 70-100 seconds and creates enough foam to complete 1 large or 2 small drinks. But what does the lower price point compromise? It’s mainly greater customisation and extra features. Unlike the Breville the Nespresso does not give you the ability to set the temperature of your foam (other than hot and cold). The Nespresso always brings your milk up to 140-150 degrees (60-65C), which is the optimal milk temperature to bring out the natural sweetness in milk. If you like your milk hotter you run the risk of burning it, but you can always give it a microwave blast. Also the heat incline is not as stable as the Breville but it works well the majority of the time. Another thing to note is that the Nespresso Aeroccino is not dishwasher safe. You’ll have to clean it by rinsing it under your tap after each use. Also if you’re making multiple coffees for several people each day then the Aeroccino Plus may be too small, however it is the ideal size for one or two people. 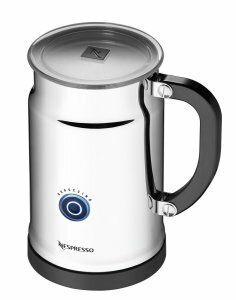 In the end if you’re looking for a milk steamer machine that can create dense foam at a quick pace and for a good price, the Nespresso Aeroccino Plus is a great choice. 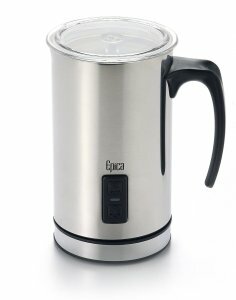 The Epica Automatic Milk Frother is the best budget milk frother. I like to think of it as the white-labelled Nespresso Aeroccino as it shares many of its features. The Epica uses induction heating, has the same capacity as the Nespresso (125ml for foam preparation and 250ml for hot milk), the same two heat options (cold or hot to 140 degrees), and is a stainless steel build. Of course when you’re buying a product with a lower price point there are always a few compromises, but if you’re content with a decent milk frother without all the bells and whistles then the Epica is a great choice for you. Now lets get into the differences between the Epica and Nespresso Aeroccino. The main difference is the way the Epica froths its milk. The Nespresso uses magnetisation to hold its frother in place and comes with 2 interchangeable disks. Whereas the Epica uses a motorised whisk that clips onto the bottom of the jug to create foam. Further it only has one whisk attachment that creates dense cappuccino foam. Also like the Nespresso the Epica is not dishwasher safe and has to be rinsed after each use to maintain it. In my experience the Epica often leaves a milk crust at the bottom of the jug so it’s essential to clean it after each use, so not to the affect the taste of the next batch of foam. Another difference that favours the Epica is that it’s easier to choose between cold or hot frothing as it has two distinct buttons – I think that’s a bit more user friendly. So which one should you get? The Nespresso Aeroccino or Epica? The Epica is usually a good 20-30 dollars cheaper than the Nespresso. So if you’re a bit more budget conscious or looking to test out a milk frother before potentially upgrading, the Epica is the way to go. However the Aeroccino is the better value frother due to its ability to create different levels of foam, clean-ability, and more striking appearance. 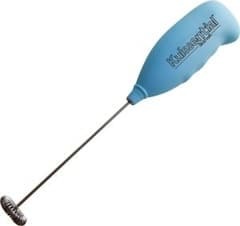 The Kuissential SlickFroth is the best handheld milk frother. Although I noted that I’m a bigger fan of jug style frothers as they combine the milk frothing and heating steps, there are people who prefer the manual control handheld frothers offer – they’re also much cheaper! So when picking a good handheld milk frother in this class it had to satisfy a few key points: durability, ease of use, and frothing capabilities. The SlickFroth came out on top for each of these points. In respect to durability the SlickFroth has a stainless steel handheld and whisk with a solid ergonomic handle and rubber grip exterior. This means it’s not only striking to look at but it wont break if it falls off the counter compared to cheaper plastic models. In terms of ease of use the SlickFroth couldn’t get easier. All you do is slide the switch forward to get the whisk spinning right away. What I found the SlickFroth excelled at when compared to other handheld frothers is that it has a much faster torque, whereas cheaper models tend to take a few seconds to get up to frothing speed. The SlickForth gets to full speed in less than a second. So the SlickFroth has a good build and it’s easy to use, but how does the foam turn out? Excellent. Thanks to the torque you can make great cappuccino froth in less than 20 seconds. Simply insert the frother underneath the surface of the milk, turn it on, and rotate it around your cup until you get as much foam as you desire. It also comes with batteries included unlike some models. Handheld milk frothers are already cheap. So when looking to buy a ‘budget’ handheld milk frother you can easily get below the $10 mark. The MatchaDNA Electric Milk Frother is our budget pick. The MatchaDNA is all about simplicity. It works exactly the same as the SlickFroth above. Just press in the button on the handle and watch it froth away. You’ll be able to make quality foam within 30 seconds. Obviously being the cheapest option it comes with a few downsides. First off batteries are not included in this product, so make sure you have a couple of AAs lying around your home before ordering. Next is the torque speed. Although the MatchaDNA does its job, it is a bit slower when compared to the SlickFroth. Finally the last issue is that of build quality. Do not expect this milk frother to be a long-term edition to your kitchen. It a has plastic handle grip and a stainless steel whisk, but it feels flimsier in the hand compared to higher end milk frothers. 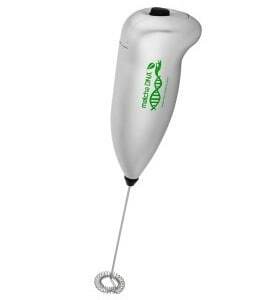 However if you’re looking for a cheap milk frother to play around with, or looking for a low-cost replacement whisk, then the MatchDNA is a good option. That wraps up our look at the milk frothers. As you can seen there’s a quite range to choose from. I’ll continually be updating this page as new products come to market so make sure to keep an eye out. Your goal now is to pick the milk frother that’s right for you. Let us know which milk frother you end up buying and if you agree with my selections.